You will earn 3,487 Reward Points. Earn 1 reward point for every 1 dollar spent. 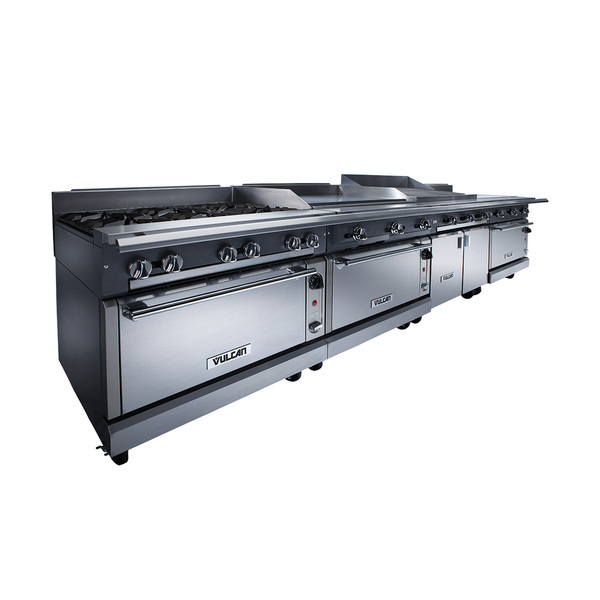 24" wide heavy duty gas range, Vulcan Model No. VGM24 (modular) and VGM24B (cabinet base). Stainless steel front, front top ledge, burner box, sides, base, and stub back. 1 1⁄4" diameter front gas manifold and 1 1⁄4" rear gas, capped. Two 30,000 BTU/hr. burners with individual pilots and controls for each burner. 3⁄4" ground steel griddle plate with 4" high side splashes. 1 1⁄4" rear gas connection. Total input 60,000 BTU/hr.